EagleSong Gardener is a gardener/herbalist, grandmother/earth-keeper and a pilgrim-adventurer from the Pacific Northwest corner of North America. She is woman with a passion for culture which she notices grows from the connection of people, plants and earth, EagleSong is founder of RavenCroft Garden in Monroe, WA. where she tends heart and soul at the hearth of RavenCroft. She is the Director of the Pacific Women's Herbal Conference. A gathering for women interested in tending life the wise woman way. A daily practice of natural health, simple living and herbal medicine anchors her herbal apprenticeships for those interested in the rigorous journey of being human. Walking with Susun, we see ground Ivy, aka creeping Jenny, and blood root which is antibacterial and a gum strengthener. Cleavers, dandelion, and violets. 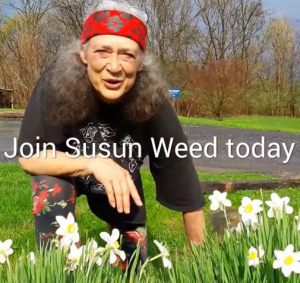 Susun answers 90 minutes of herbal health questions followed by a 30 minute interview with PWHC's EagleSong Evans Gardener. .
• gut flora, gut biome- foods that contain the most available culture..
• old cat- no tinctures for cats- comfrey infusion, hospice care for cats. • medical professionals make offerings- no need to accept. • the babushkas of chernobyl. • hepatoprotective plants- milk thistle, reishi, schisandra, astragalus- how to use. • experiencing too much stress? can show up in the body in spasms- motherwort or lemonbalm tincture..
• osha- Ligusticum porterii- use in emergency situations only..
Susun answers 90 minutes of herbal health questions followed by a 30 minute interview with 'Moodtopia' Sara Chana Silverstein. .
HeatherAsh is the bestselling author of Warrior Goddess Training, Become the Woman You Are Meant to Be. She travels the world working with groups of women to integrate the feminine wisdom of the ancients into their modern lives. • hypothyroidism healing success without taking medication..
• central sleep apnea- what is the problem with the problem..
• wholeness and integrating our darkness..
• teachings from Elisabeth Kubler Ross..
• preventing and treating ovarian cancer with ginkgo biloba tincture..
• retaining plant volatiles from mint family plants by making pestos and honeys..
Susun answers 90 minutes of herbal health questions followed by a 30 minute interview with 'Ancient Feminine Wisdom' Heather Ash Amara. .